A widower who will be 90 in November, Mr. Charles Bertram Jones, and Mrs. Edith Lloyd, a 72-year-old widow, after their wedding today at Birmingham Register Office. 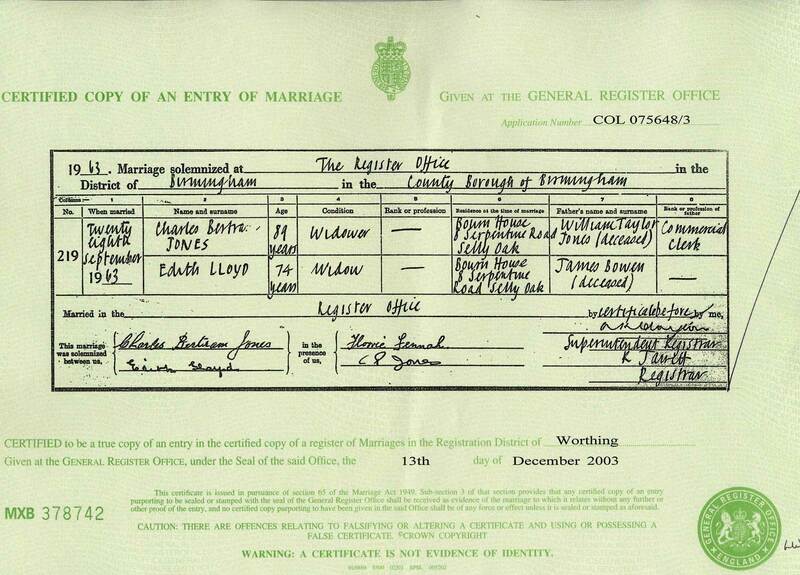 Mr. Jones, who for many years was assistant caretaker at Camp Hill Grammar School, Birmingham, and his bride met when they were living in a Birmingham Old Peoples’ Welfare Home. After a reception at a Warwickshire hotel the couple were driven to their new home at Park Hill Drive, Handsworth Wood, old peoples’ married quarters. This marriage is connected with the couple moving from one old age home to another. 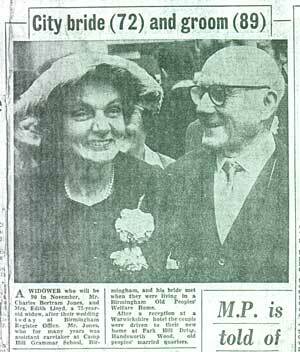 The certificate reveals the residence prior to the marriage at Bourne House, Serpentine Road and the newspaper article identifies the couple’s new home at Park Hill Drive, Handsworth Wood. I wonder about the social conditions and attitudes to care of the elderly in these institutions. Reform of residential homes for the elderly was still recent at the time following Townsend’s seminal study undertaken in the late 1950s and early 1960s. Was there any married accommodation at Bourne House? Could they have co-habited without getting married? Did the accommodation for married couples have advantages over that provided for single people? The buildings in both locations are currently local authority institutions. Park Hill is an old age home and Bourne House is occupied by Appledore Family Support Centre, which is concerned with child welfare. The current buildings look 20th century so may have been home to Charles and Edith, but this needs further investigation.